Fifteen parts, and probably fifteen to go before I publish NOD #6. 0816. Fifty industrious gnomes have established an iron mining operation here. 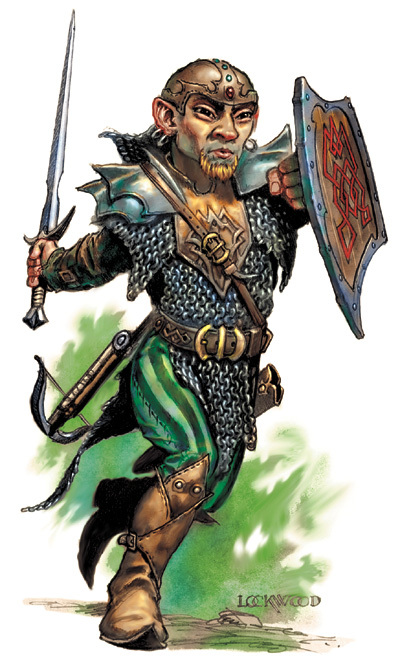 They are led by Morgenstern, a gnome veteran of countless campaigns against the kobolds. The gnomes live in their mine and have smelting ovens near the river. They are on good terms with the surrounding wildlife, and thus are rarely surprised by intruders. The gnomes have an illusory trap of a flood filling the canyon. Those who fail their intelligence save will pantomime being carried away by the waters, rolling around on the ground and eventually coming to rest a mile away having suffered 3d6 points of nonlethal damage. Treasure: Silver nuggets (10, worth 100 gp), 20 gp and three casks of brandy. | Gnome: HD 1d6; AC 7 ; Atk 1 weapon (1d6); Move 12; Save 18 (16 vs. illusions); CL/XP 1/15; Special: Cast phantasmal force once per day. Leather armor, pick, throwing axe. | Morgenstern, Fighting-Gnome Lvl 5: HP 32; AC 3 ; Save 10 (8 vs. illusions); Special: Cast phantasmal force once per day. Military pick +1 (hums in the presence of silver), throwing axe, chainmail hauberk, shield. 0831. This portion of the woodland is dominated by a great hemisphere of granite pocked with caves and covered by ancient, twisted pine trees. The mound, referred to as Bear Mountain, is surrounded by lush fields of clover and wild flowers. Black bears and a clan of werebears dwell in the vicinity. The black bears, numbering 30, live in the mountain caves, coming down to the meadow and woods to hunt and frolic. The werebears live in hive-shaped stone huts on the meadow. They keep bees and are noted for their skill in sorcery, a pursuit not usually associated with their kind. The clan consists of seven werebears led by an old male called Troff and his mate, Lir. The other clan members are all evocators (i.e. 3rd level magic-users). The werebears are presently quite pleased with themselves, as they have just created the world’s first honey golem, which they plan to use as a guardian for their domain. Treasure: The werebear’s treasure is kept in a hollow place beneath the floor of their huts. It consists of 3,950 sp, 770 gp. They also have 8 barrels of mead (30 gal. each, 250 lb), worth 8 gp each. | Werebear Evocator (4): HD 7+3; AC 2 ; Atk 2 claws (1d3), bite (2d4); Move 9; Save 9 (7 vs. spells); CL/XP 9/1100; Special: Lycanthropy, spells (2nd). | Lyr, Werebear Magic-User Lvl 7: HP 37; AC 2 ; Save 9 (7 vs. spells); CL/XP 10/1300; Special: Lycanthropy, spells (4th). | Troff, Werebear Magic-User Lvl 9: HP 38; AC 2 ; Save 7 (5 vs. spells); CL/XP 12/2000; Special: Lycanthropy, spells (5th). | Honey Golem: HD 5 (18 hp); AC 3 ; Atk 1 slam (2d6); Move 9; Save 12; Special: Immune to magic, half damage from piercing and slashing weapons, sticky, summon swarm. Grappled victims must pass a strength save or be engulfed and suffocate. Cold effects deal no damage to honey golems, but acts as a slow spell. 0909. Two strongholds overlook this river canyon that approaches Pfeife. One is commanded by the chaotic Lord Dross, the other the lawful Lord Pinkel. Dross and Pinkel are brothers with an unceasing hatred of one another. They inherited their strongholds from their father, the elder Lord Dross, a powerful and respected Knight of the March. The brothers routinely fire volleys of stones and arrows at one another’s castle, and are likely to consider any intruders in their valley to be on the other side’s payroll. Neither brother allows his henchmen to cross the river. Each noble commands 20 men-at-arms in chainmail, shield, short sword and light crossbow. 1733. Simonya of the Seven Symbols, a grand dame among elves and a well practiced sorcerer, occupies a tall tower on the banks of the river here. The tower rises five stories, with domestics and guardsmen quartered on the ground floor, a great hall of learning and a great hall of celebration on the second story, an armory and balconies on which rest ballistas on the third story, living quarters for Simonya and her court on the fourth story, and the sorceress’ laboratory and library on the fifth story. All in all, it is a cozy and well defended position, and the ballistas give her sway over all shipping traveling to and from the city-state of Amvianda. In fact, the great bolts fired from the ballistas are connected to large winches via thick, iron chains, allowing ships hit by the bolts to be reeled in and generally torn apart. The tower is guarded by a deployment of elves from Amvianda, for Simonya is a close cousin of that city-state’s Steward. The elf guardsmen wear uniforms of red leather studded with bronze and carry long swords and longbows. Their sergeant, Cearas, is a handsome elf of the old blood with the eyes of an eagle and the tongue of an adder. The Great Hall of Celebrations is notable primarily for its model of the great hippodrome of Nomo done in precise miniature. In this model, Simonya keeps several teams of horses and charioteers, all shrunk by magic. She and her court often gather around the hippodrome, miniaturizing visitors and challenging them to race or be fed to her oft invisible cat. Simonya got her nomenclature from her centuries long search for the seven symbols that, together, form a glyph of the true name of the demon prince Uvall. She now seeks the fabled Crown of Cykranosh, which is said to hold clues on how the symbols might be assembled and Uvall summoned. She believes the crown to be hidden within the so-called “World Below”, a vast dungeon extending under much of the Klarkash Mountains. Treasure: 1,320 sp, 4,270 ep, 750 gp, 240 pp, sapphire worth 7,200 gp, electrum toe ring worth 80 gp (taken from a lich, turns the toe black) and a brass arm band worth 115 gp in the shape of nymphs and satyrs. | Simonya, Elf Magic-User Lvl 14: HP 29; AC 9 ; Save 4 (2 vs. spells); CL/XP 16/3200; Special: Spells (7th), elf abilities. Dusky-skinned and painfully thin. She is scheming and casually cruel, but does honor contracts and show hospitality to guests. 2013. The mineral springs here once boasted a small shrine often visited by pilgrims in search of relief for their ills. In recent years it has been taken over by a boogle of five giant weasels. The shrine consists of a rose-blush marble cuppola containing a limestone effigy of Saint Osgiua the Sublime, a priestess of Angita, a demi-goddess of healing and witchcraft. | Giant Weasel: HD 3+3 (24, 19, 16, 11,10 hp); AC 6 ; Atk 1 bite (2d6 + blood drain); Move 15; Save 14; CL/XP 5/240; Special: Drain blood (automatic 2d6 damage). Art by Todd Lockwood – one of the many fine pieces he did for 3rd edition D&D.